Shortlisted for Waterstones Book of the Year 2017. 'A Skinful of Shadows confirms Hardinge's status as one of our finest storytellers. It's rare to find a book which is every bit as intelligent and stylish as it is riveting - I was enthralled' - Sarah Perry, author of The Essex Serpent. 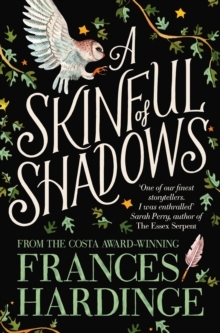 Frances Hardinge weaves a dark, otherworldly tale in A Skinful of Shadows, her first book since the Costa Award-winning The Lie Tree. When a creature dies, its spirit can go looking for somewhere to hide. Some people have space inside them, perfect for hiding. Makepeace, a courageous girl with a mysterious past, defends herself nightly from the ghosts which try to possess her. Then a dreadful event causes her to drop her guard for a moment. And now there's a ghost inside her. The spirit is wild, brutish and strong, but it may be her only defence in a time of dark suspicion and fear. As the English Civil War erupts, Makepeace must decide which is worse: possession - or death.